Now this is the most ridiculous thing I’ve read today. Royal Mail restrictions now limit people from posting more than 4 post of water-based paints in a package, and each one must be under 150ml. Water-based paint. Water-based. Water. Not cellulose, not alcohol…water. Harmless water. I know some people don’t like signing petitions, online or not, but if you’re a hobbyist in the UK this directly affects you, because your costs for getting paint will go up should you live too far from a model shop and need to order online. Got these Horus Heresy novels for my 40th birthday from the folks at work. Luckily 3 of the play 40K with me so the gift idea was pretty easy to think of – then someone had the marvelous idea to get Games Workshop’s Jervis Johnson (game designer for many or all of the GW games, including winning an award for Blood Bowl!) 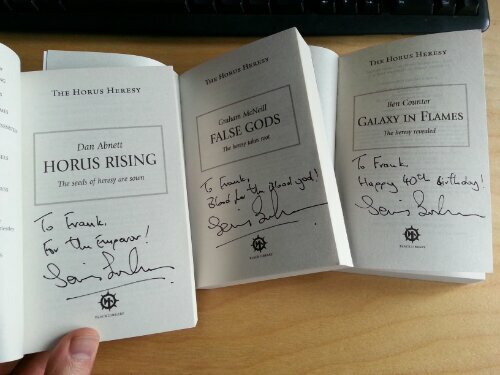 to actually SIGN all three books! Miniaturebids.com – Great ebay aAlternative! Recently joined up the new site miniaturebids.com, a global auction site meant for miniatures, models, game stuff, etc. Free to join, no listing fee and no fees at the end of a listing, plus you can put something on there for pretty much as long as you want. There are categories for GW, Fantasy Flight and other companies & categories, although the organization could be overseen a bit better (the Fantasy Flight section has Magic the Gathering cards in it the last time I checked, that sort of thing). The messaging system needs some work as well but it works OK right now, it’s just a bit clunky. Payments are by Paypal only, so any disputes are handled through them, for better or for worse. Overall it’s pretty good! For no listing or ending fees it’s definitely worth it and there’s already loads of sellers on there, including people selling really old vintage models and custom commissions. I’m excited about it and a little scared/apprehensive (because I’ll be getting paid for this and people will be expecting to learn stuff they haven’t done before), but it’ll be a pretty cool experience no matter what. I’m not expecting any problems though – I think the biggest thing will be trying to show people how to do various things on their models when they’ll be using sample models that they probably won’t have in their armies. It’ll still be good, though, and it’s definitely encouragement to keep me practicing in the months leading up to November! I do try to use my airbrush at least a couple of times a week, minimum, just so I don’t lose the ‘feel’ of using it. If anyone is interested in the class, it’s scheduled for the 23rd of November (click here for details).